Can you create music that can find a home on both sides of the Indian Ocean beyond the cliché of “fusion”? Are Indian forms compatible with their African Counterparts? Can song and the spoken word in a variety of languages make sense? Is there a soundscape lodged in the tonalities of string instruments that can find a new resonance? 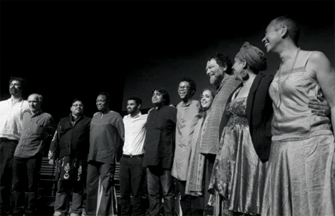 Insurrections, a collection of twelve compositions, is the product of a poetry-music collaboration that addressed these questions, that was about the relationship between word, voice, expression and sound around shared social and political concerns between India and South Africa. For the poets, it was slightly easier. There is a sense of disquiet and rebellion in the air as nature fights back at humanity’s betrayal. The more this was sensed the more obvious were the new forms of disquiet about the kind of societies we have created- those who work with nature and its angers, the miners, the farmers , the women out there in the fields and crags are in rebellion too. The lines came, the poems flowed. But could they become songs? This is always easier said than done- any good musician can improvise around a given scale and without difficulty provide hours on end of guitar, sarod or string-related solos. Could such spontaneity be disciplined into composition and song? 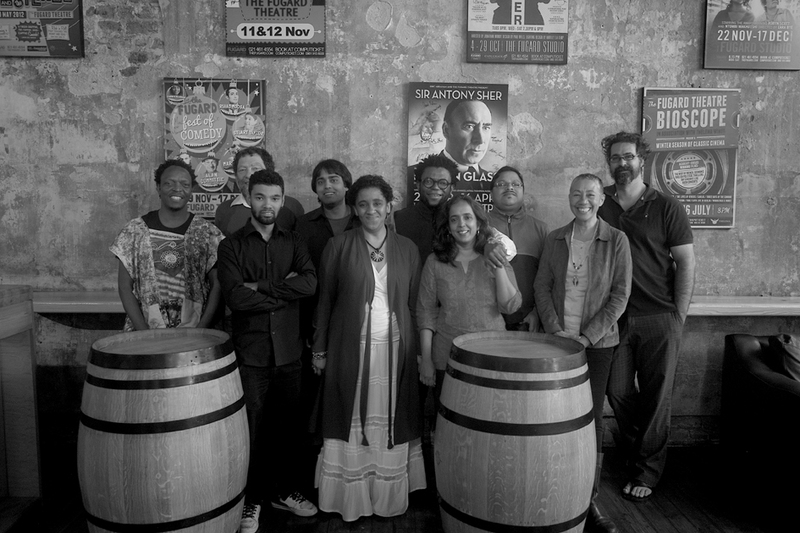 The project, which began in 2010 as a conversation between South African poet Ari Sitas and Indian singer Sumangala Damodaran, first involved the creation of an interactive, collective poetry text between Ari Sitas and Pitika Ntuli from South Africa and Sabitha T.P and Vivek Narayanan from India. The music happened in three remarkable sessions: an encounter in Delhi by Sumangala Damodaran, Neo Muyanga, Sazi Dlamini and Susmit Sen, provided the first soundscapes in Susmit’s studio in the beginning of 2011. This was followed up in Durban, between Jürgen Bräuninger and Sazi Dlamini, in Delhi by Sumangala Damodaran, Tapan Mullick and Pritam Ghosal and in Cape Town by Malika Ndlovu, Tina Scouw, Brydon Bolton and Ari Sitas. There was also, by the end of the year a Durban encounter which involved all the South African participants and Sumangala Damodaran. Malika Ndlovu and Tina Schouw took over the management of the project from Durban onwards. The Insurrections ensemble re-gathered in October 2012 for two remarkable performances at the Fugard Theatre in Cape Town directed by Neo Muyanga and Sumangala Damodaran and a subsequent consolidating session at the Electro-acoustic studio of the University of KwaZulu-Natal in Durban where Jürgen Bräuninger started the magic of producing this CD. Intense and spontaneous musical improvisation have characterised the creative process and produced the compositions in this album. It happened because a range of creative people were called together, some who can sing and play music , others who craft words, most importantly all who had faith and believed in the madness that the experiment entailed. The process involved some singing and playing, lots of listening, followed by more singing and playing around and outside words. Unbridled conversations became possible as the fretless sarod, cello, bows and the double bass interacted with each other, with guitars and drums and with Indian and African voicings, even as resonances as well as contrasts emerged in melodic and rhythmic principles. The compositional styles range from the traditional to the avant-garde, from the raga-based and Zulu scale based explorations to electronica. Brydon is a virtuoso double bass player, who learnt classical technique at an academy from a Yugoslavian cellist and jazz improvisation from the jazz players in the black and coloured townships surrounding Port Elizabeth. He is also a music educator, sound artist, curator of music and sound events, composer of contemporary classical music, and a sound designer for dance and theatre performances. Apart from playing for the KwaZulu-Natal Orchestra, he is one of the lynchpins of the highly respected Benguela trio and has beyond tight performance schedules composed for theatre and film.. Brydon’s. 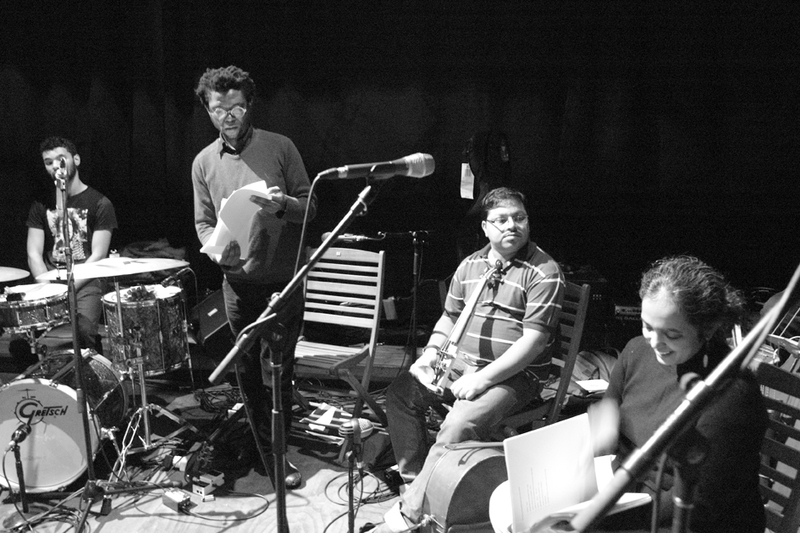 performing and composing abil­ity, from the romantic to the atonal, made him an essential cog in the distinctive sound of the Insurrections project. Jürgen is the University of KwaZulu-Natal Music Discipline’s art music composition guru and electronics specialist anywhere from Stockhausen to Zappa and African tonalities. He has composed for numerous orchestras, ensembles and electronic media. He has written music for the Siwela Sonke Dance Theatre and for film and was one of the first to put to music some of Ari’s early poems. His Durban Noise and Scraps Works is a celebrated CD of new South African music. Singer extraordinaire, composer and economist. Classically trained in Carnatic and Hindustani music, she has spent the last decade collecting the mu­sical compositions of India’s anti-colonial and working-class music from a tradition known as the Indian People’s Theatre Association. She has sung and composed for the theatre, is currently composing music for the poetry of Faiz Ahmad Faiz and completing her book on the aesthetics of the “Radical Impulse”. It was her meeting with South African poet Ari Sitas that started the Indo-African col­laboration of Insurrections. Saziis musicologist, band-leader and guitarist in the jazz-influenced South African township style. He has composed music for documentary television, theatre and film, big band jazz and numerous original pieces employing self-made indigenous Nguni (bows, drums & flutes) and other African musical instruments. 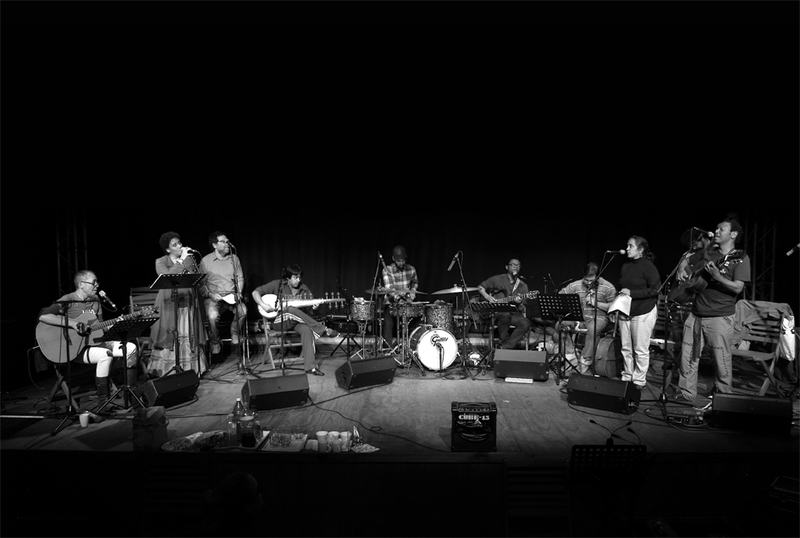 Previous collaborations with Jurgen Bauninger include Yinkosi Yeziziba (electronic music, voice, Nguni bows and percussion) and Jiwe (for string quartet, ugubhu bow and percussion). The Sarod’s new genius, Pritam has worked extensively with Sufi Mus­ician and singer Madan Gopal Singh and was key in Sumangala’s attempt to rework the musical traditions of India’s resistance providing textured renditions of the 1940s and 1950s compositions. He is a remarkable composer in his own right, an improviser and soloist- at home with classical and contemporary music. He is also a part of the experimental Indian-Belgian trio called Kurta Environment. From a long line of Kolkata based Bengali cello makers and performers, Tapan has been a major figure in Delhi’s music scene playing both classical European and Indian musical compositions for some time. His cello playing and his intuitive feel for progressive music made him collaborate with Sumangala over the years. With his cello and handmade fiddle, he became the natural counterpoint to Brydon’s South African bow. Drummer extraordinaire, jazz, fusionand experimental. One of the most exciting rhythm-masters of Cape’s jazz scene and a pulse behind Tagore’s and the Pan African Station’s sounds. Composer, multi-instrumentalist and singer, Neo has been an insti­tution of South Africa’s music scene from the popular to the operatic. A child of a Sowe­to dynasty of music, he has been key in the musical avant-garde of Cape Town where he has composed for theatre, film and orchestra. His popular duet Blk Sonshine has been a great success but so has been his Pan African Music Station which features music from the entire African diaspora. He has travelled to India and has been fascinated by the chromatic links between Kerala music and Southern African sound. He met Sumangala Damodaran whilst hosting a Toumani Diabate season in Cape Town and the idea exploded. Poet and historian, Vivek had spent time in South Africa and did not need much goading in joining Sabitha and Ari to construct the wordscapes of the project. His work has been at the forefront of a new sensibility of radical poetry, conscious of the West’s hip-hop traditions, South Africa’s kwaito and diasporic Indian forms. Award winning dramatist, playwright, performer and poet, Malika has been active as a curator for poetry festivals and projects. She has four of her own poetry anthologies, besides her work being featured in several local and international publications. Malika is a founder-member of the Cape Town-based women writers' collective WEAVE, co-editor of their multi-genre anthology WEAVE’s Ink @ Boiling Point: A selection of 21st Century Black Women’s writing from the Southern Tip of Africa. She responded to Ari’s request to project manage the work on Insurrections. She dived into the process, composing, arranging, reciting and singing. The doyen of the African Renaissance Movement in South Africa, a remarkable sculptor and oral poet, a philosopher and a dreamer, Pitika responded to the call to write for the project with energy. He and Ari were deeply involved in creative projects since Pitika’s return from exile and often improvised together in performance pieces. Sabitha is one of the powerful new- generation of poets in India having been raised in a creative family of writers and poets. She teaches literature at Delhi Uni­versity, is currently pursuing a PhD from the UK and has been a voice, both in Malayalam and English against class, caste and gender exploitation through her expressionist poetry. Her work, has been about the sensi­bility of the struggles of rural India. She was brought into the project by Sumangala. Tina is a singer, songwriter, guitarist and author who performs extensively locally and internationally. She has produced and staged her own shows, as well as collaborated with various artists on different productions in South Africa. Her music draws on an eclectic blend of styles including, folk, jazz, latin and contemporary.She grew up in a jazz family. Her father was one of the Cape’s legendary guitarists and Tina has been exploring the Khoisan, and Slave roots of music whilst becoming one of the main voices of the mass democratic movement of the 1980s. She has released three CDs one of which is a remarkable children’s compilation. She did not need con­vincing to join the project and accept arranging and planning responsibilities once listening to the music improvised by Sumangala, Neo and Sazi in Delhi. Poet, dramatist and sociologist. Sitas is a vital force in South Africa’s cultural life. That he is re-designing the landscape of South Africa’s Humanities in the country’s higher education system is the kind of minor project he might fall into occasionally. It was his poetry, especially Slave Trades, and its musical texture, that convinced Sumangala that something could be done between the two countries. Ari, often in Delhi, met the innovators of modern Indian music, the sufi philosopher and performer Madan Gopal Singh, the guitarist Susmit Sen, the poets and dra­matists of Delhi and threw his energy into this collaboration.